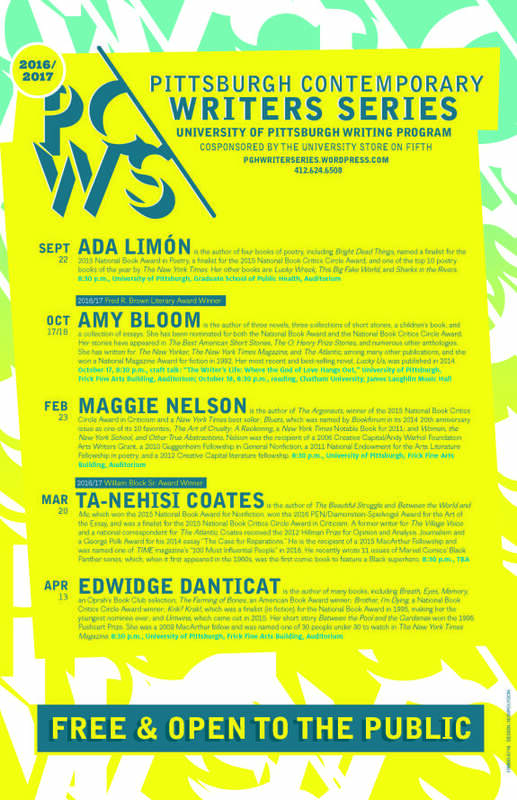 PITTSBURGH—Internationally renowned poet Ada Limón will launch the University of Pittsburgh’s 2016-17 Pittsburgh Contemporary Writers Series Season Sept. 22. The opening reading will begin at 8:30 p.m. in the auditorium of Pitt’s Graduate School of Public Health, 130 De Soto St., Oakland. Among other selections, Limón will read from the collection Bright Dead Things (Milkweed Editions, 2015). The book was a finalist for both the National Book Award in Poetry and National Book Critics Circle Award and was one of The New York Times’ top 10 poetry books of 2015. In addition to Bright Dead Things, Limón has published three other books of poetry—Lucky Wreck (Autumn House Press, 2005), This Big Fake World (Pearl Editions, 2005), and Sharks in the Rivers (Milkweed Editions, 2010)—that have received wide acclaim. She also contributed to the anthologies Poets on Teaching: A Sourcebook (University of Iowa Press, 2010) and When She Named Fire: An Anthology of Contemporary Poetry by American Women (Autumn House Press, 2008). Limón serves on the faculty of the Queens University of Charlotte’s Low Residency MFA program and the Provincetown Fine Arts Work Center. 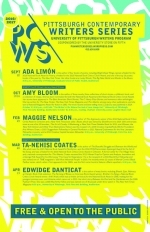 Ada Limón launches the 2016-17 Season. Oct. 17, 8:30 p.m., Frick Fine Arts Auditorium, 650 Schenley Dr., Oakland. Amy Bloom is Pitt’s 2016-17 Fred R. Brown Literary Award Winner, a designation that honors notable writers in the early stages of their literary career. She has published eight books, including three short story collections and three novels. Bloom’s most recent novel Lucky Us (Random House, 2014) was a New York Times bestseller and was named one of the best books of the year by The Washington Post. Maggie Nelson is the author of The Argonauts (Graywolf Press, 2015), winner of the 2015 National Book Critics Circle Award in Criticism; The Art of Cruelty: A Reckoning (W. W. Norton & Company, 2011), named a New York Times Notable Book; and Bluets (Wave Books, 2009), listed amongst Bookforum’s 10 favorite books. Nelson has previously been recognized with a Creative Capital literature fellowship and National Endowment for the Arts Literature Fellowship. Ta-Nehisi Coates is Pitt’s 2016-17 William Block Sr. Award Winner, a designation that honors the career accomplishments of esteemed poets and writers. Coates has been honored with the 2016 PEN/Diamonstein-Spielvogel Award for the Art of the Essay and 2015 National Book Award for Nonfiction. He has been recognized with the coveted MacArthur “Genius” Grant and was one of TIME magazine’s “100 Most Influential People” of 2016. Coates recently penned 11 issues of Marvel Comics’ Black Panther series. Edwidge Danticat is the author of the National Book Critics Circle Award-winning memoir Brother, I’m Dying (Random House, 2007) and the novel The Farming of Bones (Soho Press, 1998), which won the American Book Award. Danticat’s short story collection Krik? Krak! (Soho Press, 1995) was a finalist for the 1995 National Book Award for Fiction, making her the youngest person ever to be named a finalist for that honor. The University of Pittsburgh Writing Program and University Store on Fifth cosponsor the 2016-17 Pittsburgh Contemporary Writers Series. For more information, visit https://pghwriterseries.wordpress.com/ or contact 412-624-6508.